This problem underpins a number of the issues that I outlined in the article IT systems as means not ends. It has prompted further discussion with colleagues and clients, and led me to conversations with Nigel Green, exploring the issues and responses that he outlined in the book “Lost in Translation“. Let’s start by outlining what I mean by each of these terms, and hopefully, what you would assume that I intend to convey when I use these terms. You might wonder why I am bothering to do this? It has been my experience that these three terms are sometimes used interchangeably, when they are distinctly different (but related). The boundary of an information system, if we are using the phrase seriously, will always have to include the attribution of meaning, which is a uniquely human act. An information system, in the exact sense of the phrase, will consist of both data manipulation, which machines do, and the transformation of the data into information by attribution of meaning. Of course, the designers of the data manipulating machine will have in mind a particular set of meaning attributions and will hope that the manipulated data will always be interpreted as particular information – but they cannot guarantee that, since users are ultimately autonomous. Information technology systems encompass the hardware, software, networks, databases, configuration data which are composed in a particular manner to fulfill defined activities. Little elaboration is required (hopefully) to distinguish IT systems from information systems and business systems. Yet, in the undertaking of business change projects, sometimes referred to as IT projects, the focus of the project is limited to realising the nature and intended function of the IT system, with little, and certainly insufficient, attention to the information systems and business systems which the IT system is required to support. Of course, it is more complex than this, as information systems and IT systems can and often are created to be used by more than one business system. Nevertheless, the distinctions identified in a “simpler” scenario still apply. There is another element to the distinctions and relative importance of business, information and IT systems. 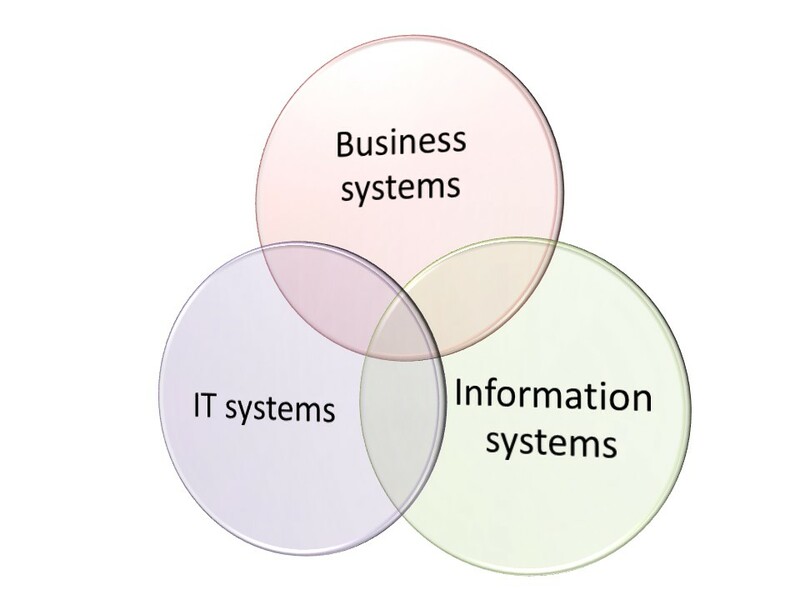 The business system provides the context within which information systems and IT systems are conceived, designed and realised. Such activities require consideration of the balance between the cost of creating and operating these systems, and the value derived by the business system in using these information and IT systems. There are numerous situations in which there will not be sufficient justification for creating proposed information systems or IT systems because the total cost of ownership (creation, operation and sustainment) exceeds the value that could conceivably be derived. This is one of the fundamental reasons why an adequate understanding of any business system is required in proposing, designing, building and sustaining any information system or IT system. Hopefully, the key implications of understanding and addressing the distinctions between business systems, information systems and IT systems are evident from the descriptions that I have provided for each. They are distinct and different. Each interacts with the other. The existence of an information system or IT system enables a business system to operate in a manner that is not possible without such systems. Design of any of these systems requires consideration of the interaction between all three types of systems and their design and future operation. There is a wide range of thinking, analysis and design “tools” which can be used to ensure improved quality and integrity of the design, construction, operation and sustainment of business, information and IT systems. Careful and diligent attention to expression of these and the distinctions between them has proven highly valuable in reducing project risk as they provide valuable reference points for all subsequent project, operations and sustainment activities. These aid in giving attention to the encompassing systems of which the business, information and IT systems are part, providing further clarity to the scope and function of the intended systems, where it will need to be recognised that changing the “part” may not realise the outcomes sought within the “whole” – typically being the ecosystem within which the business system will be operating. I have listed this first because people are intrinsic to all enterprises. People conceive and pursue enterprises. Many enterprises entail collaboration with others, engaging them in the ongoing conception and pursuit of the enterprise. Our understanding of ourselves is as much informed by our understanding of others, and vice versa. We communicate with others and that communication changes them. They communicate with us and that changes us. As we collaborate with others in conceiving and pursuing enterprises, we engage in developing a shared conception of our enterprise and the manner in which we pursue it. We share our conception and others conception may be challenged, reinforced and possibly changed. They share their conception and the same may occur. The models that we develop as part of conceiving and pursuing our collaborative enterprise inevitably entail ongoing changes to self and to others. In my experience, they are more successfully conceived and pursued when I give due attention to the manner in which others can and do contribute to the enterprise. Each time the conception of the endeavour changes, there will be a necessary change to the organisation established to pursue the endeavour. Each time the organisation is changed, we create the capability and opportunity to pursue different endeavours. If we change what we regard as internal, then we are changing what we regard as external. If something changes externally, then this may cause us to change something internally. For some enterprises, their ultimate failure has arisen through a failure to recognise the external changes that have been impacting their enterprise as each enterprise responds to external needs by making internally developed offers. This is probably the earliest “pair” that I encountered, as part of my role as a business analyst. Hence, the view that one does not exist without the other. This has provided the basis for reviewing and assuring the quality of business requirements documents, checking that there are identified processes for the information requirements, and that there are identified information domains and entities for the process requirements. Change the objectives and it is necessary to change the strategies. Change the strategies and different objectives may be realised. Whenever a different outcome is required, there is a need to determine whether that demands new or different capabilities. Whenever a different capability is available, there is the opportunity to realise new of different outcomes. Business capability models aid in reflecting the capabilities existing within an enterprise or required to pursue an intended enterprise. Once developed, it is helpful to explore the gaps in capability to inform a change or transformation program, and to articulate the outcome measures for each capability which aids in evaluating progress and degree of success. In a governance context, there is a recognition of the separation between the governing body and management. Governance creates an environment through articulation of strategy and policy within which management are expected to operate. Strategy and policy which are too prescriptive limit the capacity of management to respond the dynamic nature of the environment in which the enterprise operates. Alternately, ill-defined strategy and policy may offer a degree of autonomy such that management pursue outcomes beyond those identified by the governing body. In a management context, managers and staff reporting to a manager will give consideration to the degree to which the manager controls staff or empower staff and affords them a degree of autonomy. Staff with little autonomy will often speak of being micro-managed, implying a degree of control beyond that which they deem necessary. In a process context, consideration needs to be given to the conditions within which the process operates and the extent to which these can be accommodated by a process which prescribes what should be done versus a process which relies on the knowledge and skill of staff to determine what should be done. In each context, increasing autonomy entails decreasing control and vice versa. Careful attention is required to determining the appropriate balance between autonomy and control. Each of these dualities are important to the successful architecting, operation and sustaining of enterprises. Perhaps there are other dualities of which you are conscious and which you find important to consider? In the article about Operating Models, one of the four primary systems is the Development System as shown in the following figure. The latter can be found on Andrew Campbell’s Operating Model blog where he comments on the representation of operating models that I have outlined. The system exists from the moment that the founder creates the enterprise through to its current form. It supports the development of the enterprise through its lifecycle. An interesting set of perspectives on the enterprise lifecycle is provided by Ichak Adizes in his book “Managing Corporate Lifecycles”. Commentary on the failure of business strategy execution. It seems to me that such failure either arises due to poor strategy or poor execution. The latter reflects a failure of the development system – and its role in establishing the necessary capabilities to fulfill the requisite business strategy. Commentary on change failure or project failure. Both of these are about the failure of the development system. An enterprise can have the best strategy in the world, but if it cannot be realised, then it is of no use to the enterprise. Hence, there is a need to understand the adequacy of development capabilities and address these if strategic capabilities are to be realised. The increasing degree of change in the market / environment in which enterprises operate means that the demand and necessity to change and develop is becoming an increasingly important aspect of any enterprise. This is reflected in an increasing allocation of resources to the development system within many enterprises. In John Kotter’s article in HBR – Accelerate, John outlines the concept of a “dual operating system” within enterprises – the operational system and the change / transformation / development system – which he sees emerging in response to the increasing demand for enterprise agility and the significantly different features and culture required in these two systems. Hence, it seems to me that the demands for enterprises to change, transform and develop in a more adaptable and agile manner for their ongoing viability and sustainability are such that attention to the development system is not just becoming increasingly important, but is becoming unavoidable. The enterprise development lifecycle is shown in the following figure. The development system converts business strategy into enterprise operations. The performance system monitors the development system and the operations system in relation to progress and realisation of the intended outcomes. This provides inputs into subsequent cycles of strategy development. The development capability is simply another capability within the enterprise. It can be assessed in terms of its maturity, just as any other capability, identifying the different dimensions to the capability and which of these may require improvement. In part, the value of the maturity view is one of acknowledging and leveraging the areas of strength, and determining those particular dimensions where learning and/or change is required. With the increasing degree of change occurring in enterprises, early attention to the maturity of this capability will be critical for many enterprises. In the article about Operating Models, one of the four primary systems is the Resource Management System as shown in the following figure. The types of resources required can vary significantly across different enterprises and different industries. All enterprises have in common the need to manage finance, people and information. Many enterprises have few assets that they require and can often access the assets on a usage basis without involving the additional activities and responsibilities entailed in asset ownership. Enterprises have varying needs for materials. These activities emerge and develop as enterprises grow in size and complexity. They are most commonly seen in the form of Corporate Service Divisions or Shared Service Centres. Their establishment and operation enables others to focus on their core capabilities and ensures that a consistent approach is taken to management and availability of these critical resources. In some enterprises, intermediate products and services are developed and provided to provide more effective support to the core capabilities within the enterprise. This might constitute specific value adding services around a basic resource. For example, the fleet function in a policing organisation acquires vehicles and fits them out to be an appropriate resource for patrol staff. This takes a basic resource (car) and creates a key resource for a core capability – response to incidents. It is not a core value adding process and capability, rather it is a value adding capability in providing a critical resource. The extent and sophistication of the resource systems vary considerably for different types of enterprise and different size and scale of enterprise. In a small enterprise, the resource management capability is most likely to be part of the manager or director roles. As the enterprise grows, it might establish a “business manager” role, which may encompass a range of the resource management functions. Further growth will lead to a point where a Finance Manager may be appointed, or a HR Manager position established. As indicated earlier, these capabilities can grow to the point of an entire Division supporting the resource management systems. In such scenarios, any one of the resource management systems can be viewed as an enterprise in its own right, and will entail a complex set of systems and functions providing support to the entire organisation. Whilst these systems are not part of the operations system, delivering the core products and services of the organisation, they can be critical to the success of the enterprise, and the manner in which they operate may be part of the way in which the enterprise is able to differentiate itself.